Having already worked with Sarah Kavali on a number of items she approached us about creating this modern invite suite. Her client had seen a sample we had produced previously and loved the effect of a blind deboss. Sarah came up with a beautiful design that utilised this process in a modern style. 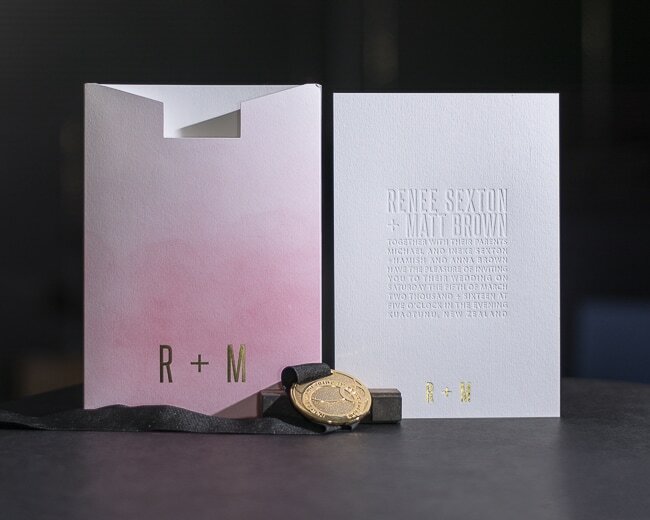 We produced a large range of items from the save the date card and pocket to the main invite and then the wedding day order of service and menus. This job had a number of challenges in designing custom pocket folds which were printed, die cut and assembled by Laserfoil. We used a stock called colorplan for the entire suite which has a beautiful old school texture. The main invite was the piece we were most proud of. Given the detail of the text we decided that a nylon plate would not be sufficient so we debossed this using a mag plate to give us crisp sharp lines. Hold this item to the light and the text appears to pop of the page at you!